Are you ready to join me in a "dance of the sun" ? Yes, finally it's June and this cold, rainy, humid weather has to stop ! We have got light dresses to wear, shorts to sport and evenings out to live !. May's weather has been totally crazy, with just a few warm and sunny days. Pants took over last month, especially because of the weather - who dared going out with naked legs ? Not me !. As always, what you see in this blog is my real way to dress...love it or hate it, I am not going to freeze over just to look "cool" on my blog or worst, wear something I dislike just because some sponsor gifted me with it, I only wear what I truly like ;). Anyway, it's time to recap my outfits for the past month. As ever, I can't wait to know your fave one !. Siete pronti ad unirvi a me in una "danza del sole" ? Sì, finalmente siamo arrivati a Giugno e questo tempo piovoso, freddo e umido deve smetterla ! Abbiamo vestitini leggeri da indossare, shorts da mettere e serate fuori da vivere !. Il meteo di Maggio è stato completamente pazzo, con solo qualche giorno sparso di sole e caldo. Devo dire che i pantaloni l'hanno fatta da padroni lo scorso mese, soprattutto a causa del meteo - chi ha osato andare in giro con le gambe scoperte ? Non io !. Come sempre, ciò che vedete su questo blog è il mio vero modo di vestire...si può amare o odiare, ma non andrò in giro svestita con il freddo, se non riesco a sopportarlo, solo per sembrare "cool" o, ancora peggio, non indosserò mai qualcosa che non mi piace solo perché un omaggio, indosso solo ciò che mi piace davvero ;). 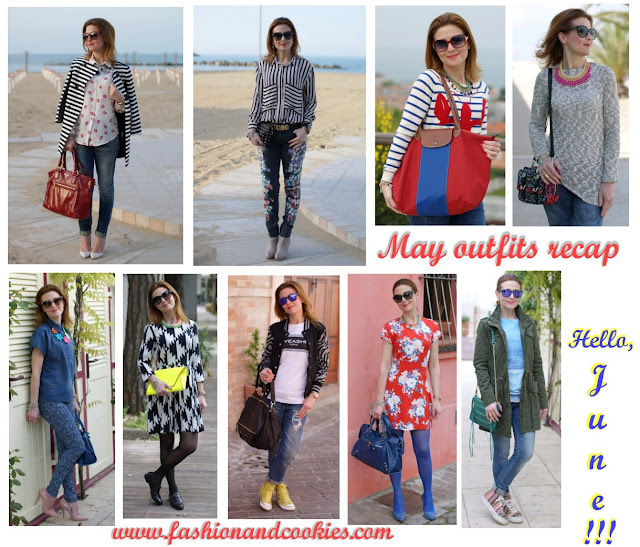 Comunque, è giunto il momento di riepilogare i miei outfits del mese appena trascorso. Come sempre, sono curiosa di conoscere il vostro preferito !. Reminder: Wizards of the West $ 50 gift card giveaway ! Only one day left ! 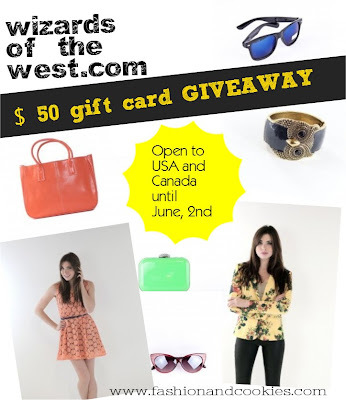 Let me remind you that Fashion and Cookies teamed up with the fashion webshop Wizards of the West, selling amazing clothes and accessories, for an amazing $ 50 gift card Giveaway, open to USA and Canada residents until June, 2nd ! To enter fill in the Rafflecopter form you find here, and to all of you, stay tuned for more surprises to come soon ! I like all of your outfits, but the most: 2,5,6!!! Kisses from Germany! Have a nice weekend! My +1G! alcuni outfit me li ero persi! magnifica la camicia con le labbra rosse!!! un bacione! Ciao! 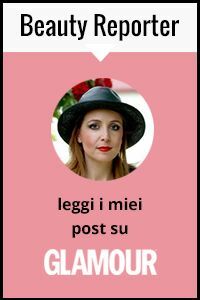 Che bei look... grazie per essere passata dal mio blog. Ti aspetto ancora. Che bello stile che hai, già l'avevo notato quando ho iniziato a seguirti qualche giorno fa. Mi piace chi accanto alle proprie foto scrive qualcosa di sé, della sua vita, delle sue sensazioni...leggere un post diventa piacevole! Grazie per essere passata sul mio blog, anche io preferisco le slippers alle ballerine. a volte sono troppo "paperelle"! Per questo mi piaci stilisticamente, perchè sei vera! Il mio preferito è quello con il cappottino a righe!! Te lo rubo!! Stripes on my shirt, flowers on my pants is my fave! Sono tutti belli, adoro il primo e il settimo! You are so stylish!! Chapeau! Dearest Vale, for me it´s the same, I´m showing always only outfits which I have worn in reality during the day - otherwise I couldn´t manage it! But I love you in all your outfits, you have such a great taste and wonderful style. If I could I would wear each outfit in exactly the way which you have done <3 So I can´t decide what´s my favourite but maybe it´s the red dress with the blue tights ... but every other outfit is perfect, too. And here in Bavaria it rains and rains and rains and it doesn´t stop. 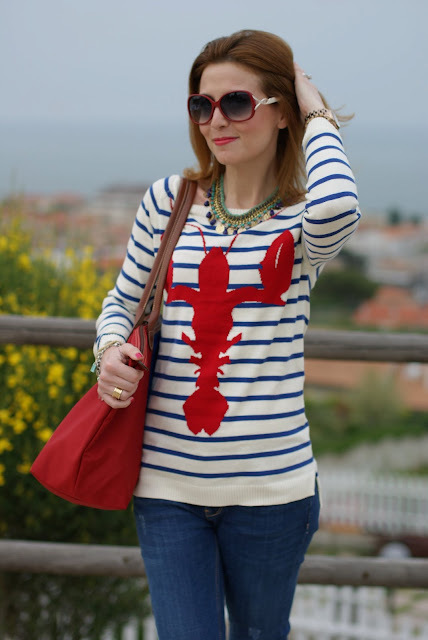 As for my favourite looks on you, I like the boyfriend jeans (been wearing one lately and I featured it on a post before the museum post), the one where you're wearing the lobster top (seen 1 before! where's yours from? ), the khaki parka, and the lip-print top. Loved seeing this stunning array of outfits, you have such incredible style! 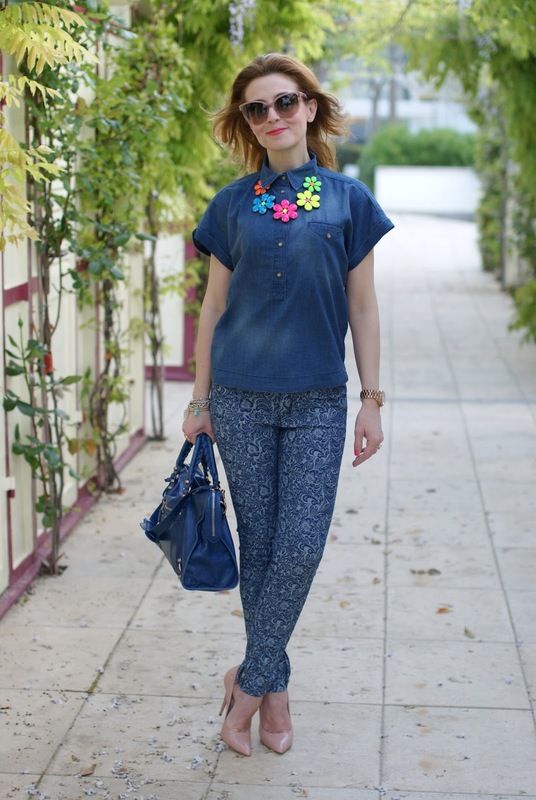 great pictures and an amazing outfit ensemble! I invite you to my blog. Che belli tutti! Un bacio cara. Ciao Vale, in effetti non se ne può più di questo tempo assurdo! Che poi non è che faccia proprio freddo, (perlomeno qui a Mi), però c' è questo cielo uggioso che mette una tristezza! Allora, veniamo a noi, i miei outfits preferiti sono il n. 4 ma sopratutto il n. 6, adoro quel vestito e l' abbinamento cromatico che hai fatto! ciao Vale ti posso dire quello che mi piace di meno..il primo!!! gli altri mi piacciono ! Hi Vale, I love all your outfits - and in particularly the red dress with the blue stockings, stunning!!! Love number 4 so much!! and girl, I am more than ready for JUNE!!!! Vale, i miei complimenti per gli outfit! Sono uno più carino dell'altro! :) tra i tanti capi molto interessanti che indossi, le tue borse sono...stupende! Tutti outfits splendidi! Il mio preferito? Quello con il cappotto a righe che ho inserito nei miei FAV! Love your stripe jacket. And stripe shirt worn with floral pants. quello con la camicia con la labbra rosse, è bellissimo! Ciao Vale, il sesto ed il settimo sono i miei preferiti!! Wow..so many great looks! So difficult to pick just one favorite! Love the black and white dress and yellow bag and floral pants so much! Hope you are having a wonderful day! you are wonderful...I think my favourite was in red dress and blue tights. thank u for yr comments in my blog...would u like to follow each other via gfc and bloglovin? hey ma mi ero persa quella deliziosa camicetta con i baci!!! il mio preferito è quello con il cappotto a righe!!! devo ammettere che i tuoi outfit mi piacciono tutti, trovo che tu sia di gran gusto. All your outfits are just perfect! ti seguo, forse vuoi seguirmi? i like them all vale, because everything you wear is marvelous! it's too hot in texas, and summer just started. I adore your outfits. I think every single piece of clothing looks so great on you.